Japan's incoming Prime Minister Naoto Kan has vowed to make the country more "vigorous", tackle national debt and improve relations with the US. 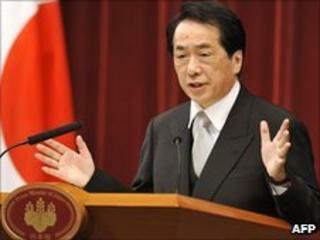 In his televised remarks, Mr Kan said he wanted to "rehabilitate Japan drastically and create a vigorous country". He said the national debt - the largest debt of the industrialised world, at nearly twice the country's economic output - should be "handled as the country's biggest topic". "Rebuilding financial health is essential for Japan's economy," he said. Mr Kan also pledged to restore the relationship with Washington, saying the Japan-US security alliance was the "cornerstone" of Tokyo's politics. He said he would honour the agreement reached with the US over the future of the the Futenma base on Okinawa, while seeking to "ease the burden for the people of Okinawa". Mr Kan's new cabinet was later sworn in alongside him by Emperor Akihito at the Imperial Palace. Announcing the appointments, Yoshito Sengoku, the new chief cabinet secretary, said the ministers were "young, fresh and enthusiastic about their jobs". "Prime Minister Kan has appointed the ministers mindful of the need to form a government with professionalism, very clean politics and ability to govern," he said. Japanese newspapers have welcomed the "son of a salary man" to the post of prime minister, contrasting his ordinary background to the privileged roots of recent prime ministers. Shinji Tarutoko, who challenged Mr Kan for the leadership, was named the DPJ's parliamentary affairs chief.